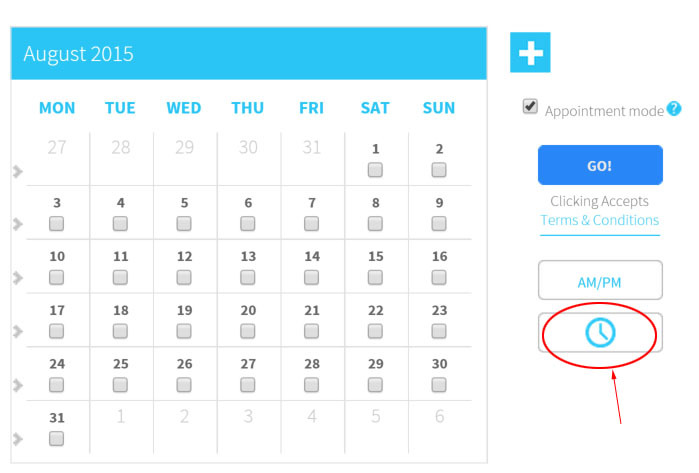 MeetOMatic Pro allows you to schedule appointments using the same MeetOMatic interface that you’re used to. 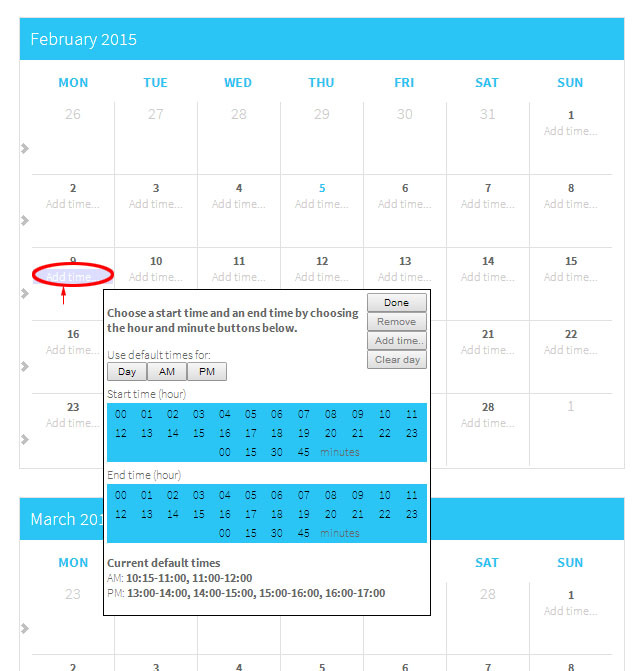 It allows respondents (‘invitees’) to choose only ONE date or time slot, and secondly once such a slot is chosen, that chosen slot is then disabled for other respondents, thus preventing double-bookings. 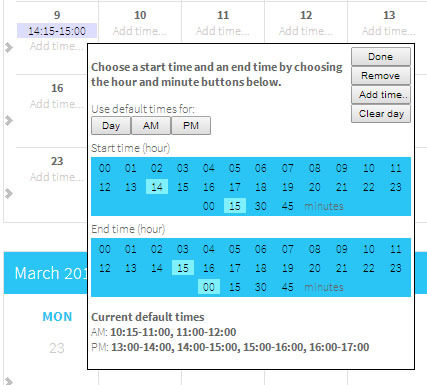 Step 4: Click ‘add time’ on your chosen day and choose your time then click ‘done’. Repeat for other days as necessary. If you have regular time slots, you can add these under the “settings” menu at the top of the page, making them your default time slots. This makes setting up repeat schedules extremely fast. In this example we’ve tried to simulate how it might be used for a driving instructor – 1hr time slots, with a 15 minute break/transport time in between each one. 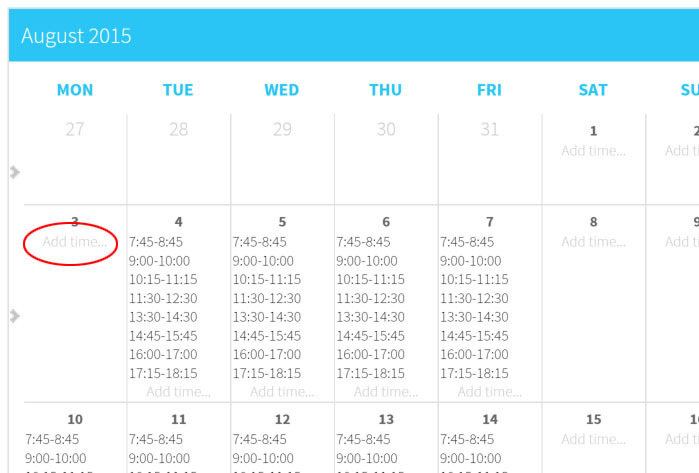 We set up the default times on our ‘settings’ page, which means that simply by clicking the day name, the month name, or the “>” at the side of the calendar we can add times for multiple days very fast. 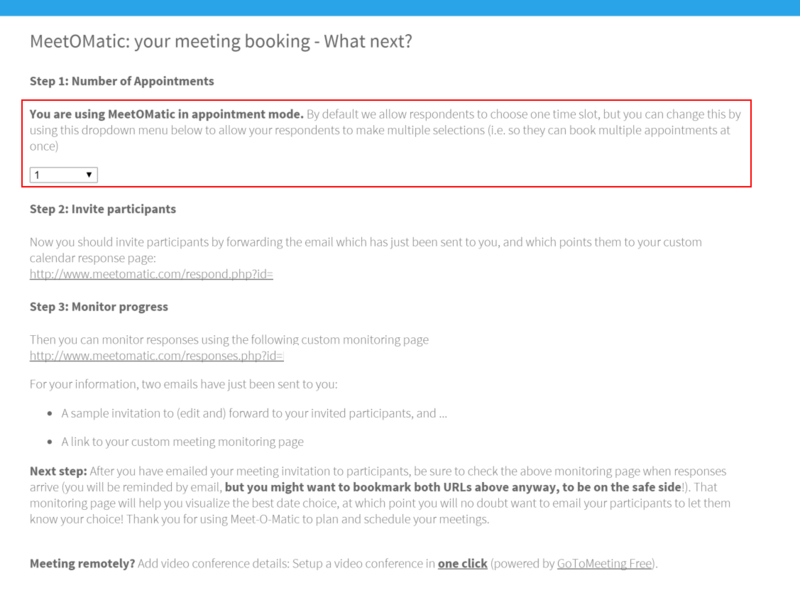 Step 6 (new): Appointment mode now allows you to allow a set number of responses to your meeting. The default setting is 1, but you can choose between 1 to 10, and unlimited responses. If you are arranging interviews you may just want to only allow one response, but if you are using it to book driving lessons, then you may want to allow your students to book multiple slots. Just choose the number from the dropdown menu and send out your link! If you’ve spent time arranging meetings, you will know that the task typically involves some tricky moments trying to satisfy everyone’s constraints and to converge on a schedule that works. Often you end up playing ‘telephone tag’ or ’email tag’ trying to chase individuals. Even if you use modern diary/meeting management workgroup or scheduling tools, things can still become unstuck if one or two individuals don’t use these meeting management tools properly (or don’t use them at all). Autonomy: People often prefer to ‘do their own thing’ (e.g. arrange circumstances to attend or avoid a specific meeting), rather than delegating responsibility to another person or a software tool. Different tools: You cannot count on everyone you intend to invite to a meeting to use the same single diary/meeting software, or even software that ‘interoperates’ (communicates seamlessly) with your own. Least common denominator: You can, however, safely assume that the people you want to invite have email and a web browser. Familiarity: People like to work with software tools they already know. Speed: People will often pick up the phone or send a conventional email rather than wait for a new software tool to help them, even if that tool looks innovative and promising. Reason? The old tried-and-tested methods feel faster! Granularity: For meetings that involve many possible dates or many people, the real problem is homing in on dates or AM/PM slots at a coarse-grained level in order to obtain a first-pass solution, rather than fussing about the precise time. In fact, a first-pass solution to a very complex scheduling problem provides such a large immediate payoff that it guarantees reuse of meeting scheduler software, even if only a few times per year. It also encourages a simple and speedy user interaction. With these principles in mind, we designed MeetOMatic so that you can deal with the ‘big picture’ focus of arranging meetings, especially large meetings, with least amount of ‘cognitive overload’ (i.e. the least hassle!). Do you agree with these principles? Let us know in the comments, or tweet us @meetomatic! We’re excited to announce a new integration with GoToMeeting’s super simple new online meeting tool. GoToMeeting Free allows you to host online meetings in just one click; perfect for meeting with colleagues remotely. You can get started in just one click, and features super easy screen and file sharing. Great for remote collaboration, meetings, and discussions. 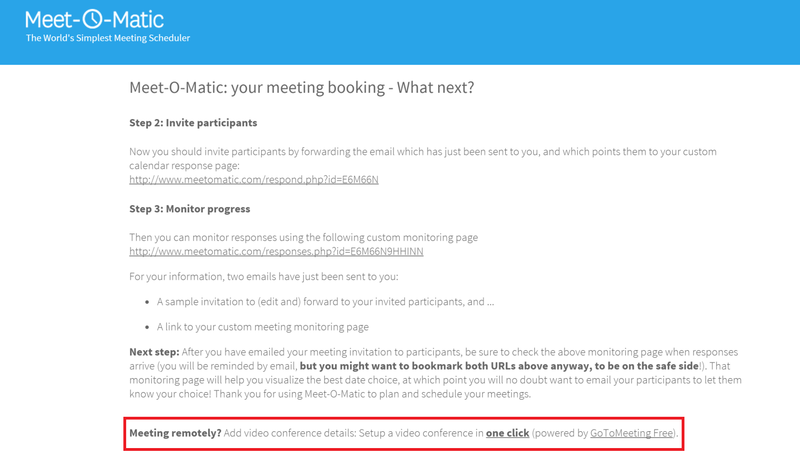 You’ll notice a new link when you schedule a meeting, allowing you to set up a web conference directly from MeetOMatic in just one click. It couldn’t be simpler! We recently received the following story from Jim Gregory, a long time user of MeetOMatic (10 years! 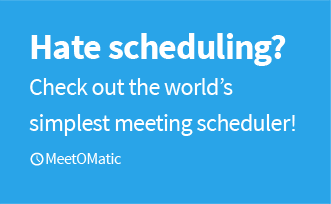 ), about how MeetOMatic has helped him with varying scheduling requirements over the years. I started using it when I worked for a large corporation that had several subsidiaries and didn’t have networked appointment management system for all of them. My internal partners loved it. I also used it to reach out set up meetings with investment management clients with far flung families. Now, I wear several hats and have no central network for any of them. I set up meetings for volunteer efforts that I organize. I also design websites for Non-Profits that get together for web site useage training. Most often, as a scuba instructor, I use MeetOMatic to sort out the best time for training sessions. I teach private classes for small groups and customize the scheduling rather than insisting everyone show up when it’s most convenient for me. When I have 5 or 6 students with all of their conflicting time demands MeetOMatic is invaluable. We love hearing stories like this, and always find it fascinating to hear the non-traditional uses people have for a scheduling tool. Not every meeting takes place in a boardroom! If you’ve got a story to share with our users then send it in! Every story that gets published will receive a free upgrade to MeetOMatic Pro. Many thanks to Jim Gregory at CustomScubaInstruction.com for sending in his story. Here’s a short video showing some tips and tricks to make using MeetOMatic even easier! It seems pretty unlikely — although mobile phone usage (especially texting) while driving is indeed a known killer — but there are some remarkable neuroscience studies that demonstrate precisely why multitasking is really quite a bad thing. Multitasking has been found to increase the production of the stress hormone cortisol as well as the fight-or-flight hormone adrenaline, which can overstimulate your brain and cause mental fog or scrambled thinking. Multitasking creates a dopamine-addiction feedback loop, effectively rewarding the brain for losing focus and for constantly searching for external stimulation. Even better, look at Levitin’s full article in the Guardian. We thought this would be of interest to our readers because meeting scheduling and management is likely to be one of just dozens of tasks you are engaged in during a busy workday, and you might want to stop and think about marshalling your attention in a focused manner for just one thing. Multiple user accounts are new to MeetOMatic this year. 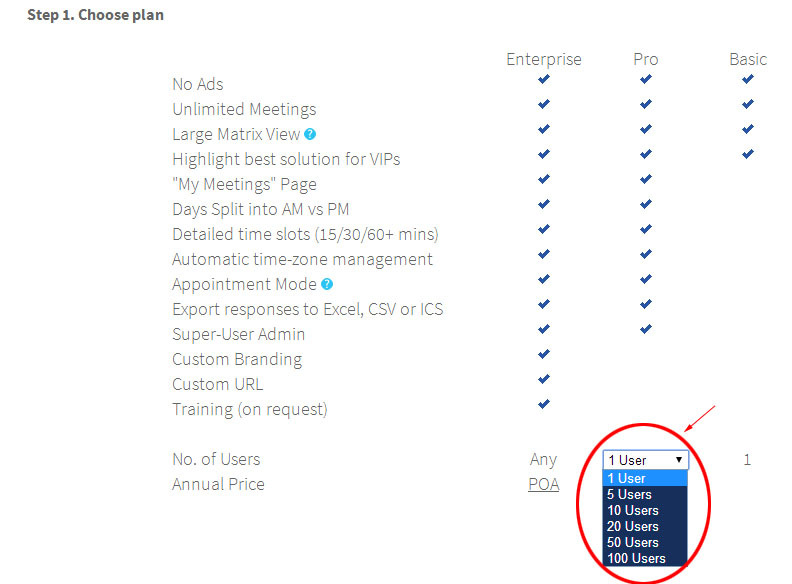 They allow your organisation to have multiple MeetOMatic accounts at a discounted rate. This is perfect for businesses who want a meeting scheduler that doesn’t cost the earth and allows all of their employees to schedule their meetings in the simplest way possible! The multi-user accounts are managed by a single ‘super-user’ has overall control over the account. This user is responsible for payment and inviting their colleagues to use MeetOMatic. Step 1. 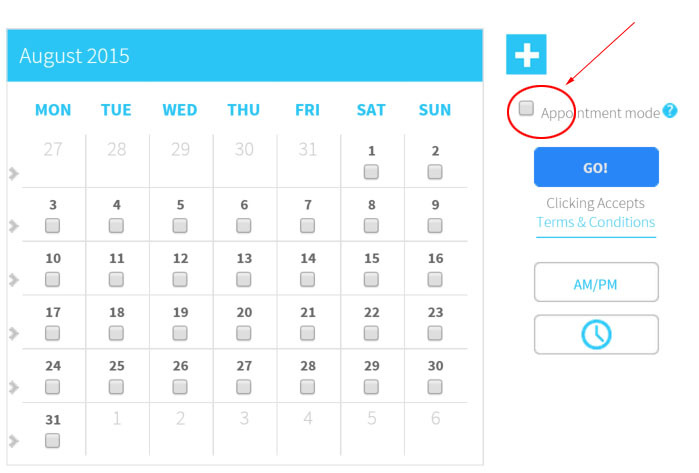 Simply choose the number of users you require from the drop-down menu on the sign up page. Step 2. Enter your details and proceed through to the payment page. Step 3. Once your payment has been processed (usually instant), you’ll receive an email with an activation code. This email can either be forwarded directly onto your colleagues, or you can copy and paste the link from the email to send to them. This link will enable them to sign up for MeetOMatic Pro at no additional cost, as part of your organisation’s account. Once logged in, you’ll also find these activation details under “Manage Group” in the top right of the page. From here you’ll be able to see your subscription key, as well as who has signed up, and the meetings that have been scheduled. 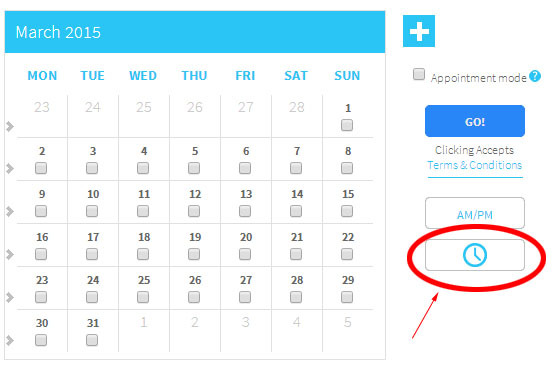 You can also quickly select multiple dates by clicking on either the day name, the month name, or the “>” at the side of the calendar. I had the great good fortune to work at the headquarters of Apple Inc. in Cupertino, California, in the early 1990’s, as part of Apple’s Advanced Technology Group. The period when I was there happened to coincide with the period during which Steve Jobs had been ousted from his own company, before his game-changing return in 1997. Even in his absence, however, it was obvious that his ‘fingerprints’, ‘vibe’ and ‘ethos’ were everywhere, but the ‘vibe’ was slipping and the ship was floundering in his absence. Jobs’ style and influence are well-documented and easy to find, so I’m adding this little note just to point out a handy article I came across recently that highlights the ‘Steve Jobs approach’ to efficient meetings, which will be of interest to many Meetomatic users and more generally to our blog readers. Jobs’ techniques involved keeping meetings small, making sure that there was a specific named person driving each agenda item, and refusing to let people use PowerPoint as a veil to bluff their way through poorly-thought-out ideas.